A: I love discovering things, creating things…I have been at Steve Spangler Science for 5 years. I’m blessed to have my job and life. I believe to whom much is given, much is required. To give back is one of my life’s main goals. Working at Steve Spangler Science gives me a chance to do that -it’s fun. Q: What do you do at Steve Spangler Science? A: I am responsible for all of the shipping for Steve Spangler Science customers, including LTL and international shipping. I also help with receiving. Q: What do you like best about what you do? A: The people. I love the people I work with and almost all of them are personal friends outside work – it’s family. I think that’s what makes this place special. Q: What is your favorite Steve Spangler Science moment? 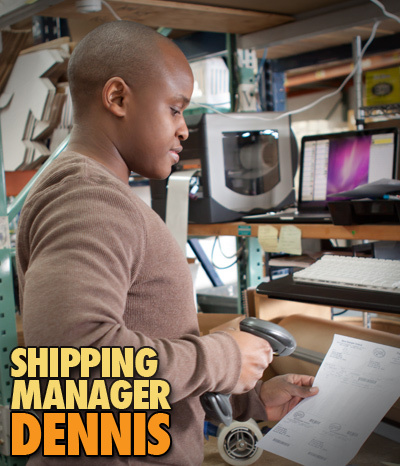 A: When I was given the opportunity to step into the Shipping Manager position. It was a great opportunity to have a voice in a company that I believe in. Q: What is something you wish every SSS customer knew? A: Our Team motto: Make it big, Do it right, and Give it class! Q: What is your favorite science experiment? A: Without question the Insta-Snow experiment. I saw Steve demonstrate it at a conference and saw how excited the teachers were. I enjoy demonstrating this experiment and seeing the smiling faces. Q: What do you like to do when not on the job? A: I enjoy spending time with my girlfriend, working out, playing basketball, attending sports and music events. A: Our deepest fear is not that we are inadequate. Our deepest fear is that we are powerful beyond measure. -Marianne Williamson said it and by golly I like it!